The new Qless software at Metro Codes is meant to make waiting for service easier. The system allows customers to leave the waiting area and receive a text message to return for an appointment. 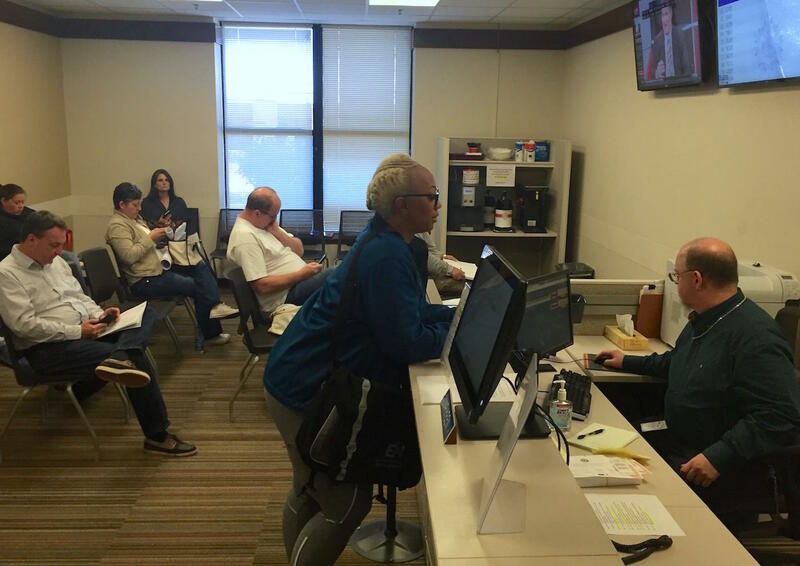 As Mayor Megan Barry arrived late morning on Tuesday, the slick digital screen for customers estimated a wait time of 4 hours and 9 minutes for the last person in line among about two dozen who sought permits, inspections or answers to zoning questions. The mayor came to see a new system meant to make the wait more convenient — and the crowd did take note. Yet broader concerns persist about understaffing at Metro Codes, and what some say is a lack of oversight over Nashville’s record-setting building boom. “There’s a lot of frustration that the level of service that we need for our county just isn’t there,” said Metro Councilman Brett Withers, who represents part of East Nashville. Withers points to a survey of council members that asked which Metro departments pose the most challenges for residents. The technological advance that the mayor came to demonstrate arrives at the same time that the overall efficiency of Metro Codes is being studied by an outside consultant. Until those results come in, officials took the morning to praise a software system called “Qless,” which streamlines the process for getting in line. 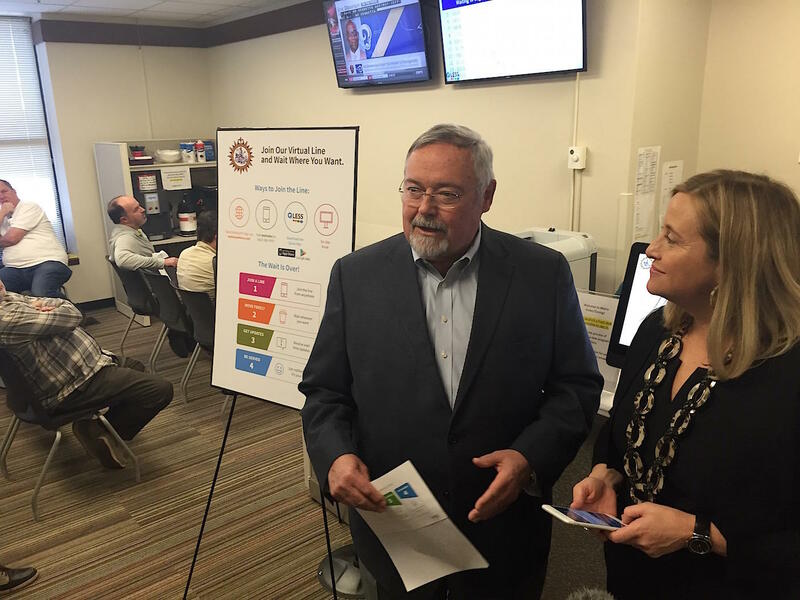 Codes Director Terry Cobb and Mayor Megan Barry demonstrate the new Qless software at Metro Codes. With the Qless system customers can get a spot in line in person, through a phone app or by computer. Then they can stay busy working, and receive text messages as their appointment approaches. In a moment of candor, the officials invited a regular customer to share her tale of long lines at Metro Codes. “You would come in at like 6:45 in the morning and line up and you were out there in the wind, snow, and rain,” she said. With the text message reminders, she can stay busy instead. “My productivity at work has shot through the roof,” she said. So the experience is now more convenient — but the time it takes to actually process each request hasn’t changed. That’s where concerns like those from Withers, the councilman, come in. In East Nashville, Withers represents a hotspot for growth — the interests of both residents and the development community. Withers says his questions to Codes, even as a councilman, sometimes go unanswered. Estimates for wait times can surpass four hours at Metro Codes. So Withers and other council members tried to take action this spring through the Metro budget process. “The council members asked: Do you need more staff? Do you need more staff? And that was turned down,” he said. In those hearings, Barry asked Cobb to address complaints about lack of responsiveness and long lines. She also asked whether he would have use for 20 more building inspectors. Codes ultimately added three positions, bringing the budgeted staff to 107. As Cobb touted then, his agency has now returned to a pre-recession staffing level, growing after several years of cuts. Yet much has changed. The department is handling a record-setting amount of construction that is worth twice as much as the prior high, back in 2008. Many of the proposals, along with local regulations, are now more complex. The department has also taken on oversight of all the city’s nearly 2,000 Airbnbs and vacation rentals. One staff member handles those requests, leading to multi-hour waits like one experienced by architectural historian David Price. Withers said he feels the same, unconvinced that the staffing has kept up with the workload. Asked Tuesday whether he could have expanded staff capacity, Cobb, the codes director, agreed he had sufficient council support to request more inspectors in early 2016. He said he did seek funding for two inspectors in the property standards division, which responds to complaints ranging from improper building to tall grass to unlicensed short-term rentals. Since then, the mayor has hired a consultant to study that division from “top to bottom,” he said. That will include comparisons to peer cities and to industry standards on measurements such as wait times. Staffing requests could follow, Cobb said. Whether positions are added, filling them has already been a struggle. There are six openings now, with one job posting on the city website. A half-dozen vacancies has been the norm in recent years. If you wonder just how much construction is going on in Nashville, here’s a dollar figure: The city is on pace for $3.7 billion in new homes, high rises, and hotels this year. Every month for five years, Nashville has booked more hotel rooms and collected more hotel taxes than the year before. At a press conference where tourism officials touted the achievement, Amanda Hite, president of the tourism research firm STR, says this kind of growth surprises her. The Nashville region has been building so many hotels over the past five years, she says, that she didn’t expect there to be enough demand to fill them. The Nashville Farmers' Market has been through tough financial times, major policy changes, and even accusations of discrimination. But market leaders now say they’re confronting a new challenge: popularity.